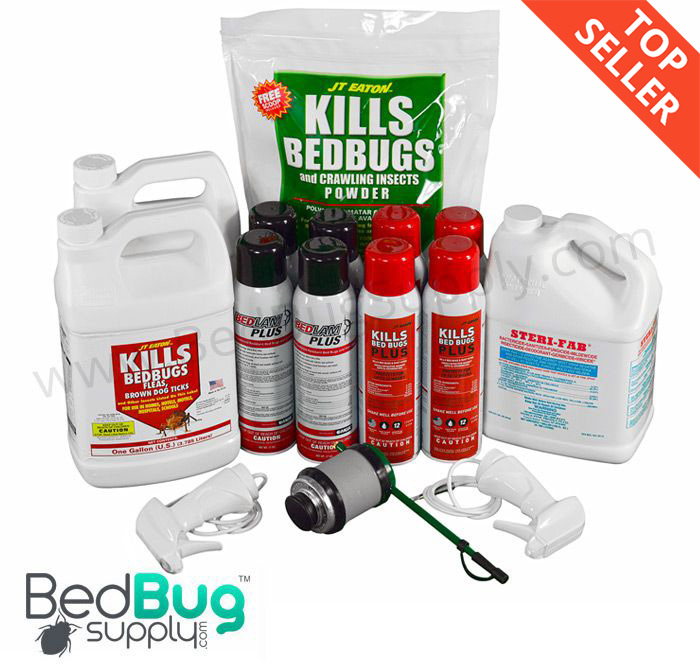 Kill Bed Bugs Like The Pros With Our Commercial Bed Bug Kit. Having the right tools to kill bed bugs is essential to success, which is why Bed Bug Supply offers bed bug kits allowing you to kill your beds bugs while saving hundreds of dollars doing it yourself. We've helped thousands of people rid themselves of bed bugs and we can help you do the same. We not only offer products to kill bed bugs, but also provide videos and tutorials on how to treat bed bug infestations step by step. We can also be reached by phone toll free at (866) 238-9868 or by email at [email protected] This kit contains enough product for 3 complete treatments. Q: How many rooms does this treat. Commerical Professional Kit? The commercial kit can generally treat up to 8 rooms. This varies depending on the number of spot treatments needed, the size of the room, and the number of applications (we recommend 3 applications total, separated by 2 weeks each). Completely wiped out our infestation. Very important to get the interceptors and the encasements also. Reviewed by: Jackie from baltimore, md. Reviewed by: Daniel from Tallahassee. Your kit arrived quickly. I had already watched your videos. They were very helpful. Did everything just as you said. So far so good thank Heaven! Also liked the unmarked package. Reviewed by: L Singleton from Earleville MD. Reviewed by: Dorene Holliman from Euless. I am just so grateful to have a company like yourself that I can depend on when it comes to bed bugs. It is good to know that you are continually coming up with new and better products to eradicate these pests. I also appreciate the chat line when I have questions. Thanks you so much for being available. Without you, I would be insane right about now. Reviewed by: Catonia King from 4828 Bowland Avenue. I received my bedbug supply very quickly. I treated the area the first time and have not seen any bedbugs. I bought the traps for under the bed legs and they have been clear. I will do the second treatment in 5 days. I am very happy with the results. Reviewed by: Mike from Indiana. I had a terrible problem with bed bugs, so terrible in fact that they were attacking within a couple minutes anytime someone sat down. I had been using a product purchased at my local Farmer's Co-op store, which was a huge waste of money. I bought the kit4-5 Professional Bed Bug Kit (Commercial Application) With Bedlam Plus and noticed a difference right away. I used per instructions and was bed bug free after 4 applications. It has been a year since that first application and am proud to report that I am still bed bug free. Reviewed by: Mary from Arkansas. I would be happy to review this product if I had received it. I was impressed with your 1-2-3-4 steps to rid house of bed bugs and eagerly ordered the kit. However, the kit has still not been sent in all parts so I cannot complete all the steps and this compromises the ability to completly get rid of these bugs. What is the problem? This is the second time I have quesioned this order. Reviewed by: Linda Hager from 3669 sutter court oceanside ca. The product we purchased was the bed bug kit it arrived in three days and we followed your instructions for best way to apply and use the products. After doing so we have not seen any bedbugs or signs of bedbugs and best of all no one is being bitten. Our bedbug nightmare started after my so returned from a boy scout camp in Virginia you never think something like this will infect your home and cause such problems. When we contacted Orkin they wanted $2600.00 to treat our house and would only guarantee the process for 30 days. We are so glad we found your company. Reviewed by: Chuck Collins from North Carolina. This worked great! We have a big house 5 bedrooms plus a theater room and a play room and this was more than enough to treat our house even twice. I have not seen any bugs reappear since we have sprayed. I definitely recommend these products. Reviewed by: Heather from Dallas.